Once I got the correct size needles I moved forward fairly quickly. I'm not totally happy with the heel. 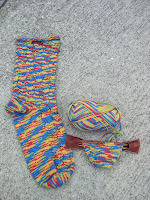 I've changed the pattern for the second sock. 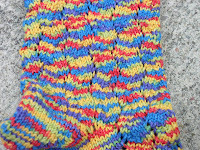 I used Priscilla Gibson-Roberts short row heel. the way i read it, the knit stitch decreases were worked through the back loop. I don't like the look of that. It doesn't match the purl decreases. I may have that backwards. I fix it when I get to the second heel. I have shown a close up of the lace pattern. The color repeats are very short. I was looking for something interesting, but easy. I love the feel of the Panda Cotton yarn. The Shy Sheep Vest event in the Vest Vault keeps growing. 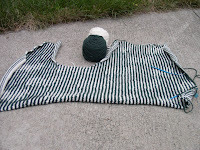 The picture shows the left front and the back to the edge of the right armhole. That means 13 sheep finished out of 20. I'm now up to 15 finished sheep. The edges will be tamed by green I-cord. I'm thinking about white buttons, because I have some I could use. I will finish both events before the end of the Olympics. I will not be entering any events as a late substitute. I have been asked to redesign and write patterns for a local yarn company. I'm taking something designed by someone else which is selling yarn for the company and reworking them because the other designer changed her business plan to be unrealistic for the yarn company. I'll rework them to something similar, but different.